The Woolly Brew: Follow Your Arrow... finally finished! Follow Your Arrow... finally finished! 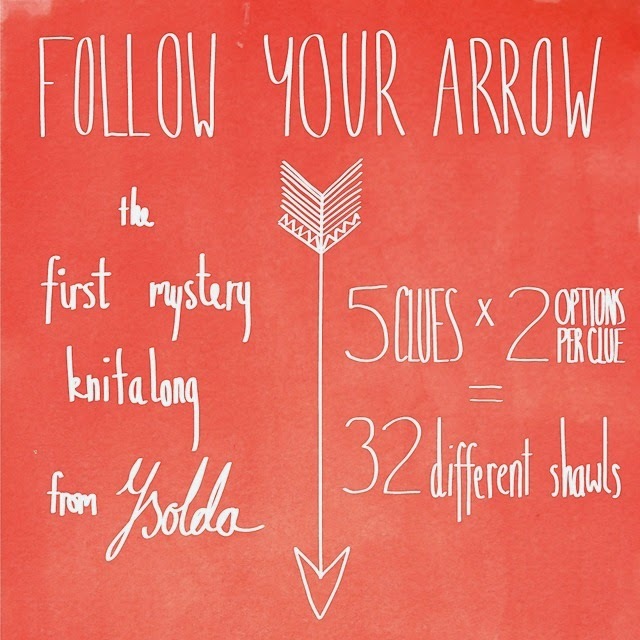 (Fiona) Like thousands of others I took part in Ysolda Teague's first mystery knit along - Follow Your Arrow. 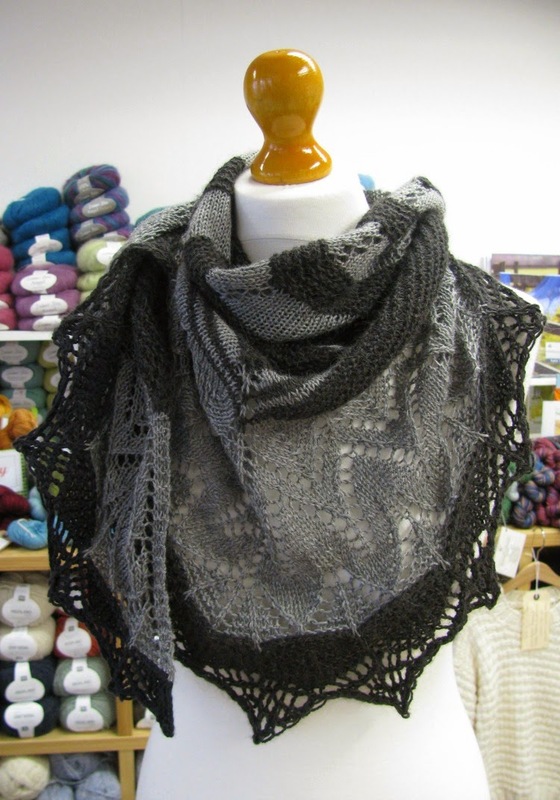 A shawl pattern. If you want to maintain the mystery please stop reading now. 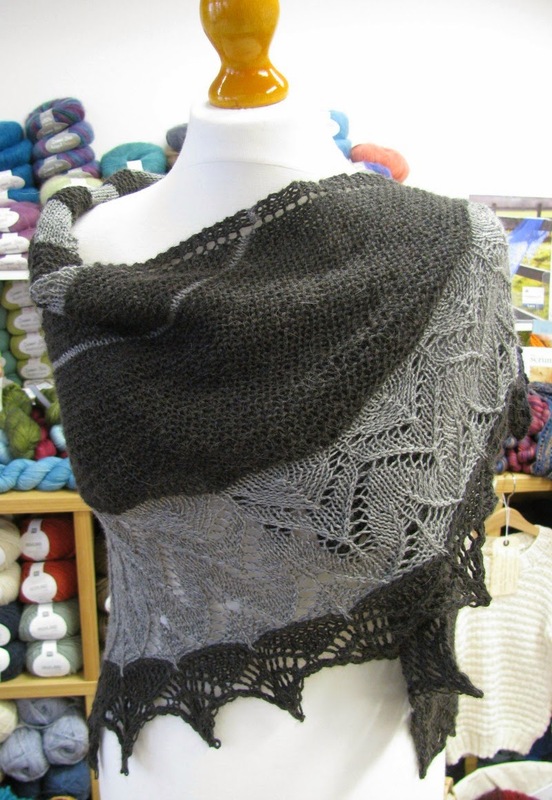 This article has photos of the finished shawl! The knit along started in January and a new clue was released every week for 5 weeks. Within each clue you had a choice of 2 options (A or B). There is a group on Ravelry with lots of in progress and finished photos of all the different combinations of clues. I choose to do the following combination - ABBBB. I also used two colours. Whilst following the mystery knit along you have no idea what is coming next (unless of course you wait a few days and see the spoiler photos on Ravelry!). So you've little idea how your shawl will turn out... I based my decisions on how I was feeling at the time... So I did the simpler option for some clues and the more complicated option for others. I choose the 'kite' shaped clue to start with as I've never tried that before. Ysolda offers lots of advice in the pattern and in the Ravelry group - with video tutorials for the more uncommon techniques). There is also advice for yardage requirements (which I appeared to have ignored as I ran out of yarn!). The stitch patterns are both written and charted. You can still buy the pattern on Ravelry in its knit along format - so you can download each clue as you need to. 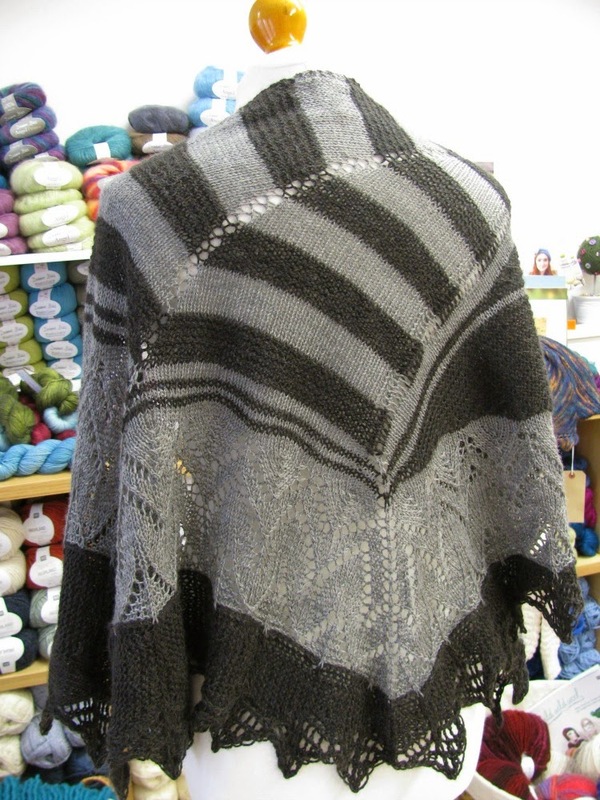 This is the first large 4ply shawl I have made - and it is a size that I like alot. I will definitely be making more shawls this size. 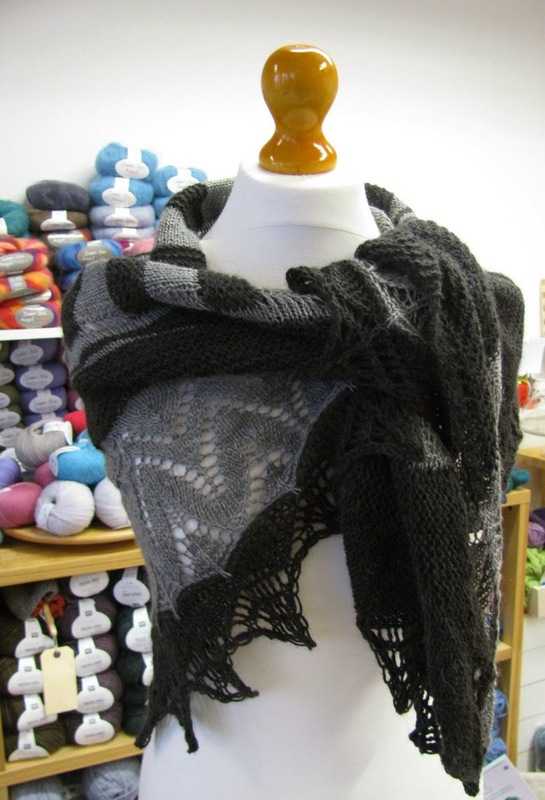 It is also the first 2 coloured shawl I have made, and I will try that again too. However, I'm less happy with my choice of yarn - the dark charcoal alpaca I choose from my stash is too hairy and I feel some of the stitch definition of that knitted on edge is lost. It would have been better using black Artesano Definition (like I used for the grey). I'm also not sure of my combinations... 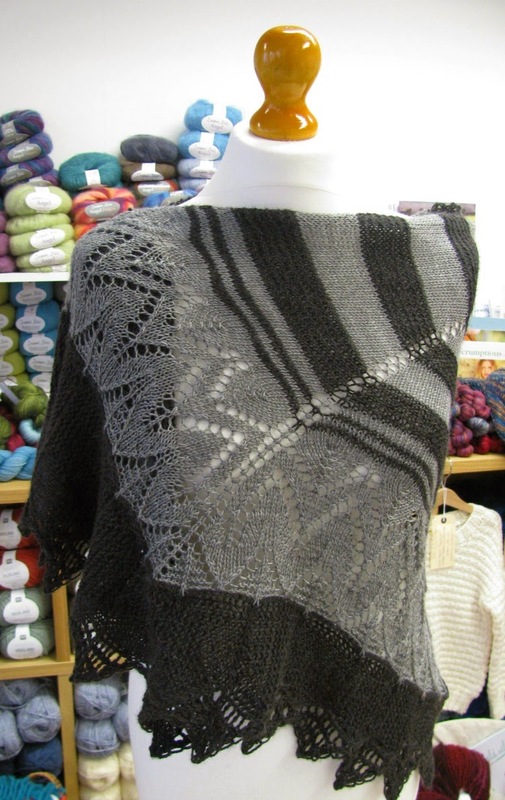 I wouldn't have chosen to knit this shawl if presented in its final form - I would have been more likely to knit the semi-circle shaped combinations. It's abit too eclectic for my personal taste. BUT having said that - I am so pleased I knitted it! And with its large size you can easily tie it around your neck and all the different sections contrast so well. * I did knit a few other things - Azurine, Spring Kerchief, DK socks and Cozy Bottle!